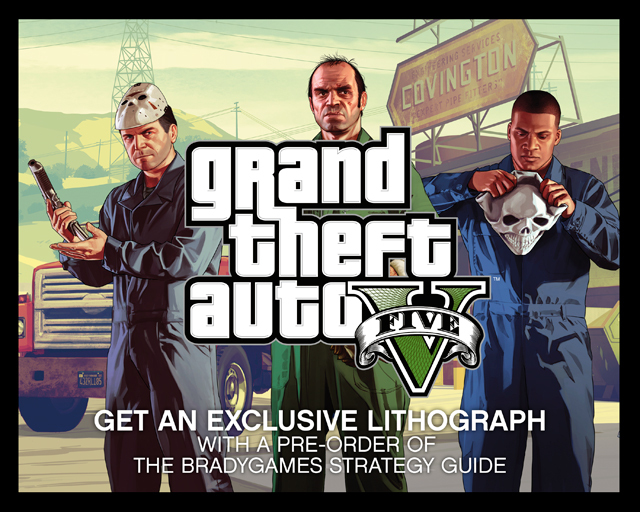 Pre-order the Official Grand Theft Auto V Signature Series Strategy Guide from BradyGames and you'll receive a free exclusive lithograph of the illustration above, where Michael, Trevor and Franklin are preparing to take down an armored car in one of the upcoming GTAV missions. The hardcover bound Limited Edition (£19.99, 432 pages) includes all the content featured in the Signature Series edition, plus an exclusive bonus lithograph and a collection of GTAV illustrations. Both the Signature Series and the Limited Edition will be available with the game at launch on September 17th.